This is a particularly special suite as it is actually the design I created for my own wedding! I have long been in love with delftware blue and white plate designs. The classic suite features a number of woodland animals and fantastical plants. There is the tiniest accent of amber in the fruit on the vines to create a lovely complimentary contrast to the elegant suite. 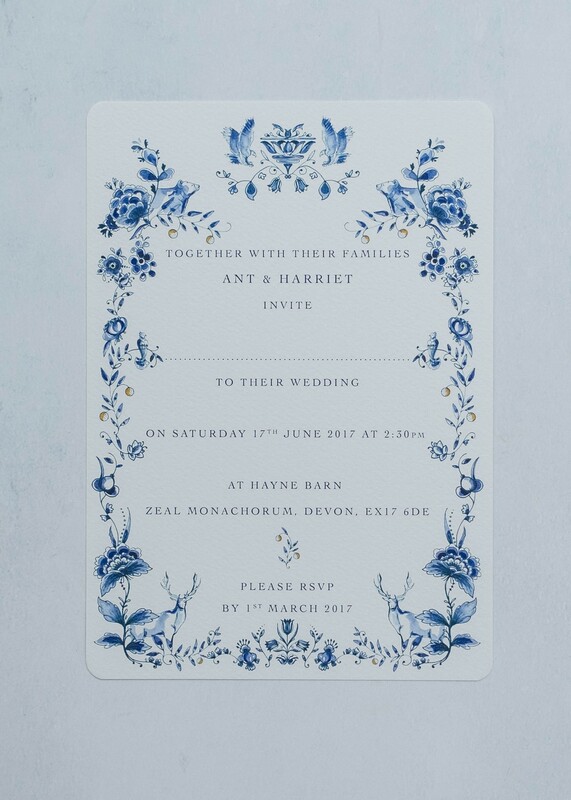 With curved corners and details everywhere you turn, this is a wedding invitation suite full of beautiful hand painted illustrations. As with all pre designed styles you can pick and choose which items you need and you can either click and buy on the website. Or get in touch with me if you would like to talk through your options first. Ophelia can be found in our Romantic Collection. 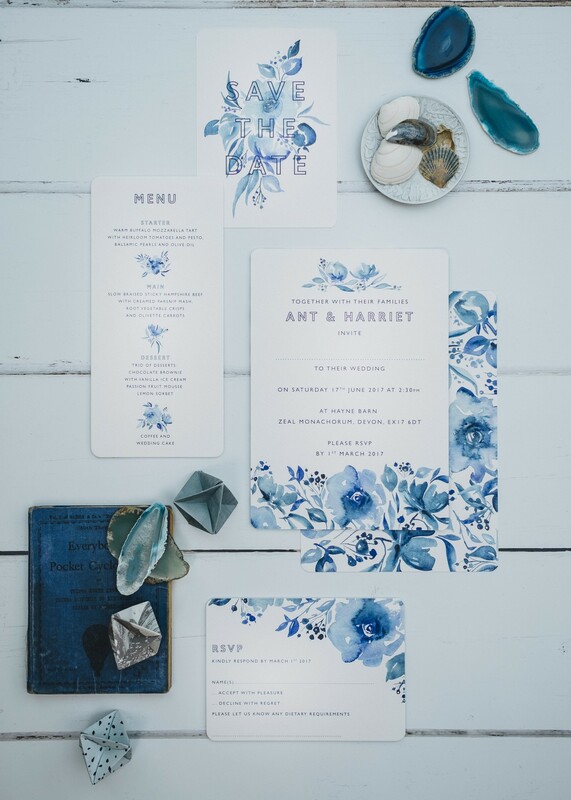 If you love Blue and white but are after something a little more contemporary, how about ‘Something Blue’? 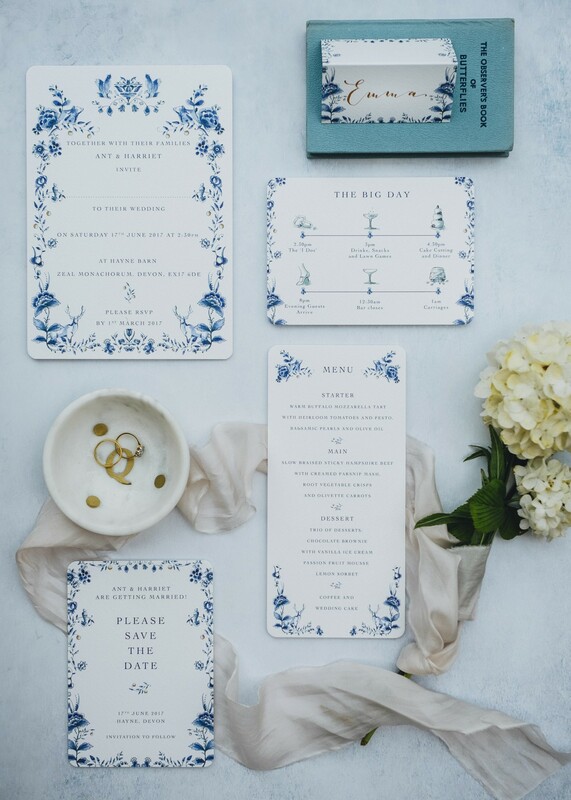 The Something Blue wedding invitation celebrates big washy watercolours with a gorgeous double sided design. Team this with some of my favourite fonts about at the moment and you have yourself something really different to anything else out there. 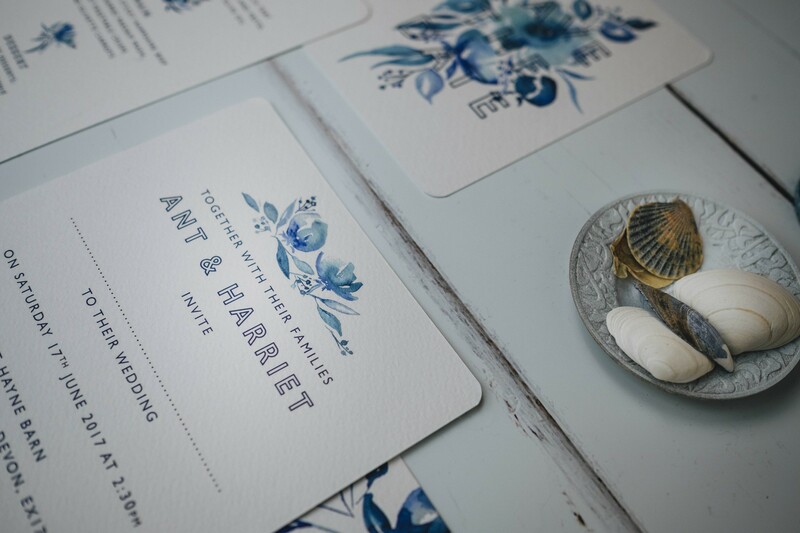 Of course all our designs are hand painted before being scanned into the stationery layouts. Curved corners and an abundance of big beautiful blooms, this is a really special suite that can be found in our Contemporary Range. Bloom is full of sweet sorbet shades and pops of gentle colour. 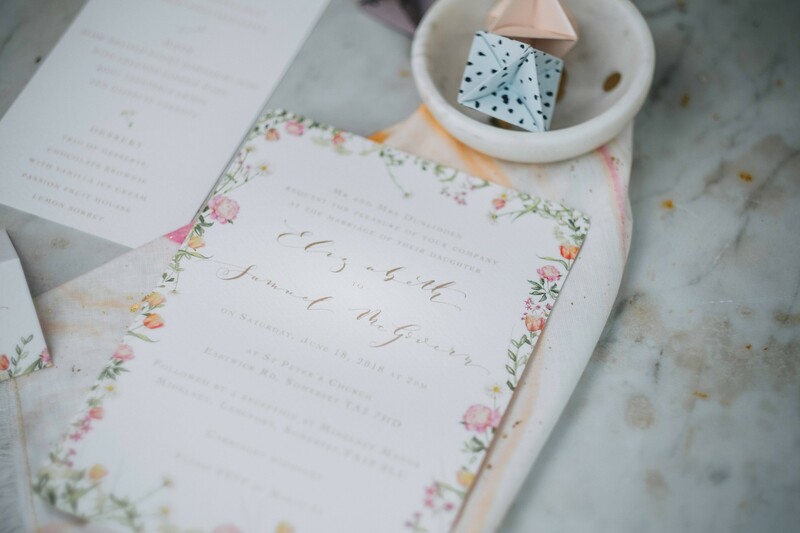 Featuring peonies, tulips, daisies, cow parsley and plenty of wild greenery. 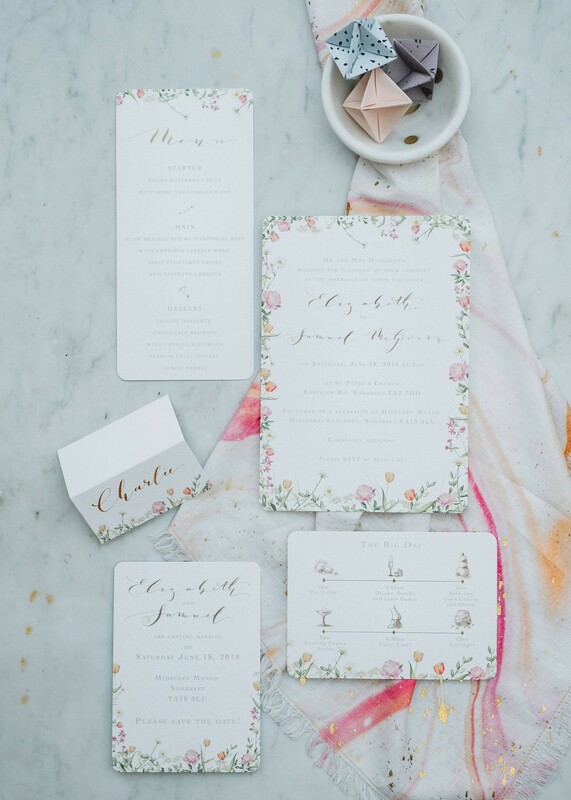 Combined with some muted modern calligraphy this is a beautiful collection for a country garden wedding. With curved corners and abundance of blooms, the Bloom collection is featured in our Modern Classic collection. I have been drawing bees for as long as I can remember. 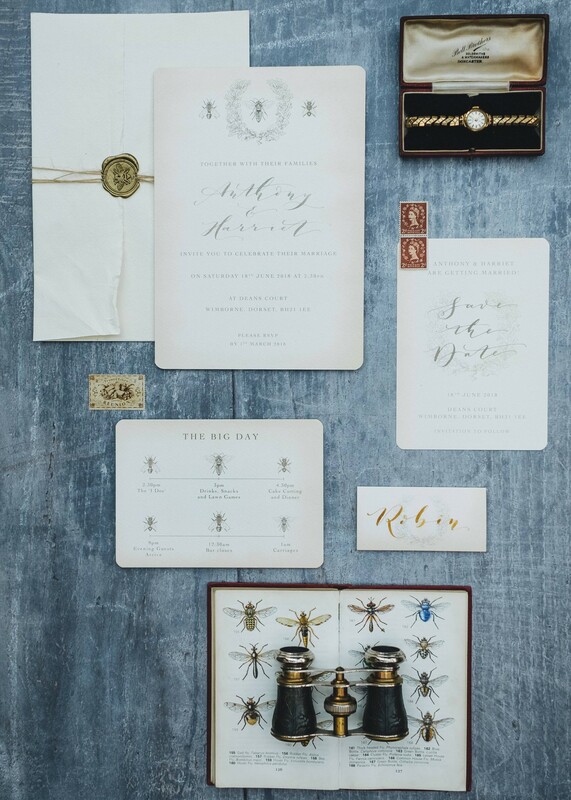 In the Romantic collection, the Queen Bee wedding invitation features my pen and ink illustrations of three types of bee: Drone Bee, Worker Bee, and of course, the Queen. She sits in the centre bedecked by an acorn wreath. 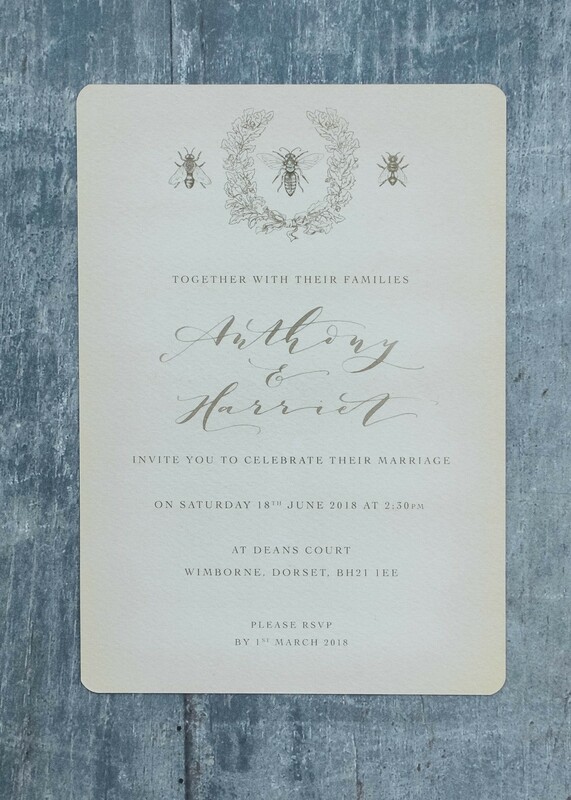 The aged paper style and muted modern calligraphy makes for a honey gold hue to this suite. Perfect for outdoorsy types or those with a penchant for vintage style. As with all our Pre Designed collections, I am really happy to hear of any minor design changes you might like to make to these collections. We can personalise these for a small design fee, I look forward to hearing from you.